So simple, and yet so good. This is definitely the most basic type of sushi, and the most common one seen in media, sushi bars, and anywhere else sushi or pictures of sushi might be found. Not surprisingly this is what most people thing of when they think of sushi. Tuna (maguro) nigiri is something I get at almost every sushi restaurant/bar I go to, just because it is so darn delicious! However I wouldn’t recommend serving this to people who are grossed out by the idea of eating raw fish… a little too much of a fishy flavor for that. Personally, I think it would be better to start out with yellowtail (hamachi) or white tuna (ono)… they have much subtler flavors, and are much softer to bite into! Cut the tuna into slices larger than your rice balls. Place each slice of tuna on top of a rice ball. You may place a small dab of wasabi on the underside of the tuna if you wish. Mmm! I love tuna! Spicy tuna, also. I just feel bad that it’s bad for the environment these days. Question, though. 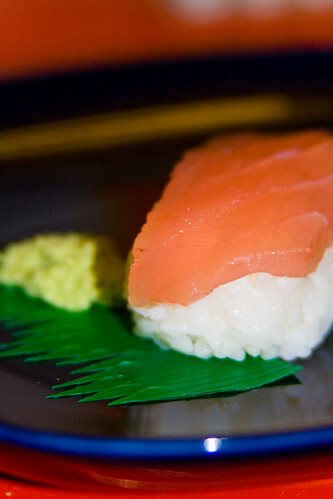 When preparing sushi, how do you know it’s safe for serving? I’m too scared to make sushi on my own at home because I don’t know what the hazards are in serving raw fish. Yummy!!! I LOVE tuna, any kind. You are so lucky to be able to get it fresh. It’s pretty difficult to find sushi grade anything in a small town in the midwest. This comment is for Alice. Talk to your fish monger, they are the best to give you info on what you can use. 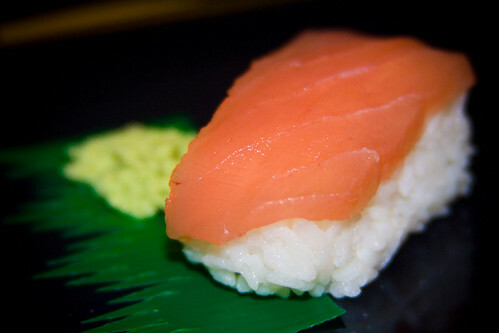 If your still not sure, there are alot of sushi out there that isn’t “raw” that you can make. I use alot of canned fish (tuna, salmon, mackerel), unagi (eel), imitation crab meat, and fresh veggies. Give it a try. I like making Salmon Nigiri with the left over salmon I have. Also I like the design the Salmon makes. It’s really hard to cut the perfect looking Salmon for your nigiri but it all tastes the same. I was in the grocery store (Harris Teeter) yesterday collecting some ingredients for my second sushi-making attempt. I was only going to buy the “safe” stuff for rolls for now (imitation crab, veggies and tempura shrimp) but I lingered a little too long by the meat counter. The guy that worked there talked me through my sashimi fears and I ended up going home with a sashimi-grade tuna steak. He said it would be fine refrigerated for up to three days, but we ate it that night. We made both nigiri and a roll with it. It ended up being delicious, definitely tasted fresh and none of us got sick! Yay! So if you have fears too, just talk to the guy behind the counter. The fish on display was actually labeled “sashimi grade” but you can always ask too. You can ask to make sure it was frozen properly first as well. I read somewhere that if it is frozen to the right temperature first any parasites that might have been in the fish will be killed. Alice – I understand the argument against eating bluefin tuna, since there is a shortage and we might make it go extinct. So I do my best not to eat bluefin… there are plenty of other types out there! Is that what you meant by it being bad for the environment? Or did you mean something else? Mark has some good tips for getting sashimi-grade fish! Mark – It’s one of the benefits of living in California. 🙂 Thanks for the tips about finding sushi ingredients! I’m sure a lot of people are finding that to be helpful! Christina – Thanks for the story! It’s always nice to hear about everyone’s sushi-making experiences! And I’ll bet your story helped alleviate some raw-fish fears. 🙂 I’m so glad to hear you liked the recipes and had fun making them! Chak – You’re very welcome! I am a fishmonger working for a national certified organic grocer (that shall remain nameless, but can be deduced through cursory googling), and I highly recommend that if people (without boat-owning neighbours) are looking for sashimi-grade fish that they buy ‘superfrozen’ – that is, fish that has been caught, gutted and frozen to -76Â°F on the boat. Freezing to such extreme temperatures completely stops all microbiological activity, and when defrosted is actually closer to ‘fresh’ than never-frozen fish, which can sometimes go at least a week from capture to being delivered to your local fishmonger. If you live in the midwest where fishmongers are uber rare, you can head to you local butcher. Most of them have sashimi grade fish which has been flash frozen on the ship and slow thawed in running cold water at the butcher’s. Interesting tip! I’ll bet my midwestern readers will appreciate this! Thanks!